Warm the olive oil in a large skillet over medium heat. Add the shallot, garlic, pepper flakes, mustard seeds and sesame seeds. Stir and cook until the garlic starts to brown – under a minute. Add the tomato paste and tamarind concentrate, stir to combine. Add the chickpeas and corn, stir to coat and cook for a minute or two. Add the coconut and 1/2 to one cup of water – enough to make it somewhat saucy. Add all of the spices and the sugar. Bring to a boil, reduce heat and simmer for about ten minutes, to warm and combine everything. Add the broccoli, stir to coat, and cover and cook till it’s just bright green and just as soft as you like it. Season with salt pepper and lemon. Serve over basmati rice, if you like. 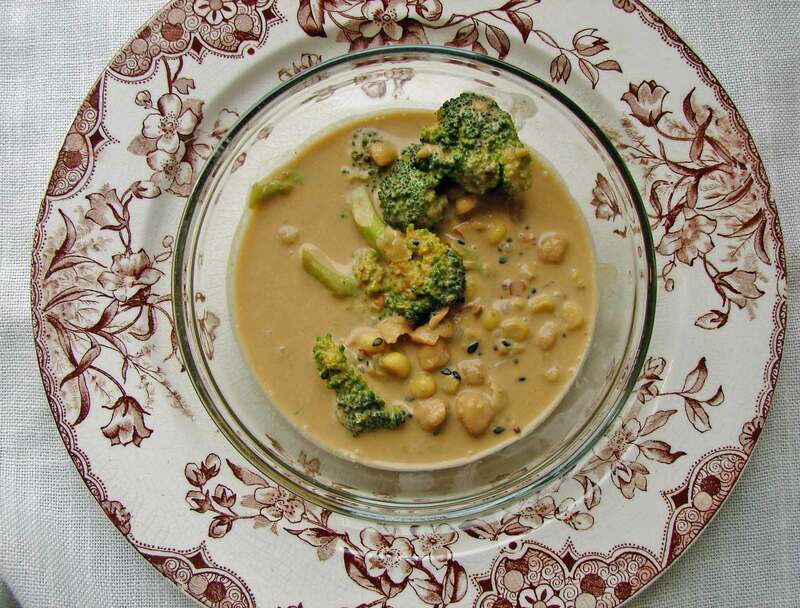 This entry was posted in beans, recipe, rice, sauce and tagged broccoli curry, brothers karamazov sequel, brothers karamozov, chickpeas, coconut curry, corn, food in brothers karamazov, tamarind by Claire. Bookmark the permalink. Anna Karenina is one of my favorite novels and one of my favorite aspects of novels is the food they portray. The Russian world at that time is such an interesting place culinarily speaking and I love learning about the characters through the food they enjoy. It does make them seem more real to hear about the food they like. Eating and enjoying food is such a normal, every day human thing, but it feels just as important as the bigger drama, somehow. I loved Anna Karenina, too – I particularly like Levin’s character. I’m scared to see the movie, it looks a little over the top. Have you seen it?